Junior Nature Sketch is an outdoor nature program for kids that focuses on sketching and observing wildlife habitats in unique ecosystems. 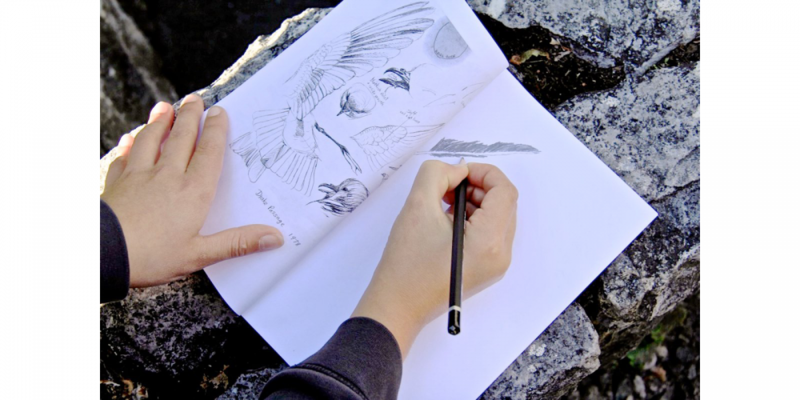 Guided by a sketch artist and a naturalist, this program encourages children to connect to natural environments in their local community using a pencil and a sketchbook. Many children spend more than 6 hours per day on screens, and less than 30 minutes per week in nature. Nature Sketch aims to change that – encouraging fun, developing creativity and building confidence along the way. Take a look at the dates and locations below. Children learn about their local area and wildlife using established eco-literacy principles from world-renowned artist and naturalist, Robert Bateman. The cost of the program includes 7 weeks of ecosystem outings guided by an artist and a naturalist, Nature Sketch full lesson plans, a special NatureSketch Club book, and all sketching materials. The program also includes a final exhibition on week 8 where the children’s sketches will be framed and hung on display at a local venue. Appropriate for ages 5-12 yrs. 8 week program, 2.5 hrs per week. Need more information? Give us a call at (250) 940 3626 and ask to speak to our Programs Team.